At this point, there is no question that we are the main drivers of climate change. The way we live, our consumption and economic needs, basically most human activities release deadly greenhouse gases into the Earth’s atmosphere. 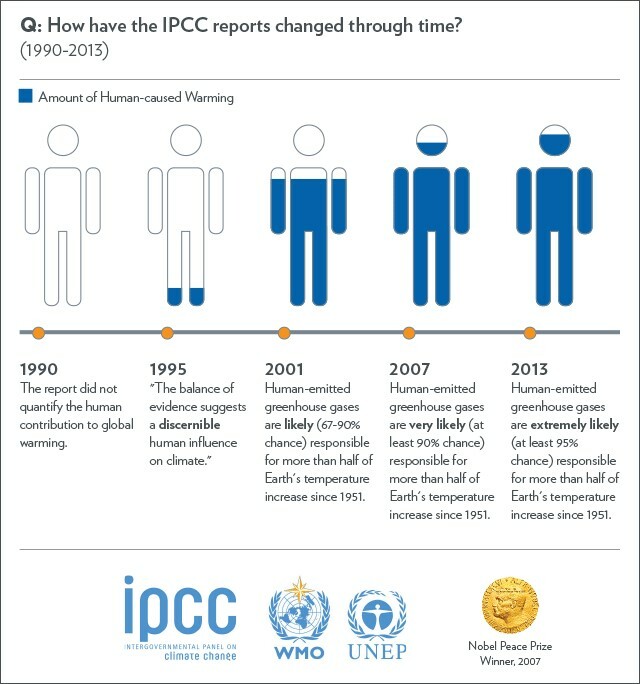 The 2014 graphic below provides a visual timeline of when the Intergovernmental Panel on Climate Change (IPCC) began acknowledging the human contribution to global warming. Almost all countries acknowledge the issue of climate change, however even after signing the Paris Agreement in 2016, many are still finding it difficult to cut back on their carbon emissions. In an article I wrote a week ago, Germany, considered to be a leader in climate change policies, remains strongly dependent on coal, one of the dirtiest sources of energy and a major contributor to carbon emissions. But, in order to understand the connection of our impacts to climate change and why countries are having difficulty reducing their greenhouse gas emissions, the carbon emissions intensive industries must be analyzed. At the outset, it must be understood that while human activities result in smaller carbon emissions as compared to natural sources, it is the steady increase in the volume of these emissions that has thoroughly upset the natural balance and led to disastrous effects on the environment and the planet as a whole. To illustrate, there is a natural carbon cycle. Carbon is emitted by the world’s oceans, plants and living things. These emissions are also absorbed back into the environment, which in effect, keeps the natural balance. However since humans have extracted fossil fuels which have caused emissions to steadily increase since the Industrial Revolution, only 40 percent of human emissions can actually be reabsorbed by nature. The remaining 60 percent stays in the atmosphere and is responsible for trapping heat in the atmosphere, leading to the warming of the planet. So where do all of these human-induced carbon emissions come from? The burning of fossil fuels for energy production is single-handedly the biggest source of carbon dioxide emissions. In a report published by the United National Environment Programme (UNEP), the “supply and use of fossil fuels accounts for about three-quarters of mankind’s carbon dioxide emissions.” The energy created from the combustion of fossil fuels is used to produce heat, electricity and generate power for homes, offices, manufacturing and construction, among others. The images below from the showcases the amount of carbon dioxide and greenhouse gasses emitted for energy production vis-a-vis other sectors. The contributions of economic sectors to global greenhouse gas emissions. Credit- From the FAO report ‘Greenhouse Gas Emissions from Agriculture, Forestry and other Land Use’ 2016. Energy production depends on three main types of fossil fuels: coal, natural gas, and oil. These fossil fuels are responsible for 43 percent, 36 percent and 20 percent respectively of carbon emissions. In 2017 alone, there was an unexpected surge in carbon emissions due to coal burning in China as a result of the drought that drained its rivers and affected its hydropower generation. Since energy production is the sector most responsible for greenhouse gas emissions, our collective efforts to reduce energy waste in our homes, switch to energy-efficient products and put pressure on our governments to invest in renewable energy will go a long way to tackling climate change. Related Post: The Future of Food: Would You Eat Lab-Grown Meat? The industrial sector that includes mining, manufacturing, and construction has produced as much as 21 percent of carbon dioxide emissions in 2014. According to a report, the five industry categories of paper, food, petroleum refineries, chemicals and metal/mineral products are responsible for contributing the most greenhouse gases. This is because the use and combustion of fossil fuels are essential to the various steps of manufacturing and industry processes. As an example, the conversion of limestone in the cement industry requires the combustion of fossil fuels in order to generate heat. Another big culprit of carbon emissions is the transportation sector. According to a report, road transport is responsible for 72 percent of the sector’s carbon dioxide emissions, marine shipping producing 14 percent and global aviation 11 percent of emissions. Plus, there are still indirect emissions as a result of the transportation of goods. This main sources of greenhouse gases for this sector are electricity consumed, energy used for heating and cooling, refrigeration, and so on. Data shows that as much as 3.38 million gigagrams of carbon dioxide was released by this sector in 2010. Aside from these top five sources of human-induced carbon emissions, other sources include solid waste disposal, handling and incineration; and other sources such as fossil fuel fires and other anthropogenic sources. It’s clear that in order for our countries to meet their Paris Agreement obligations and achieve sustainability, they must tackle these carbon-intensive activities. What climate change actions do you want to see your country take that they aren’t doing so already? Leave a comment and let’s start a discussion.